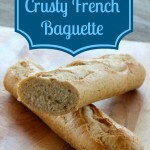 My hubby loves this Crusty French Baguette Recipe! One of Bill’s favorite breads is the crusty French Baguette and he says that my recipe is one of the best he has ever had. I had never made a French Baguette until we moved here to remote northern Maine. Bakeries were plentiful in southern New Hampshire where we grew up so I never had the need. But here in northern Maine bakeries, and in particular ones that sell traditional ethnic breads like Baguette and Italian breads, are nonexistent. 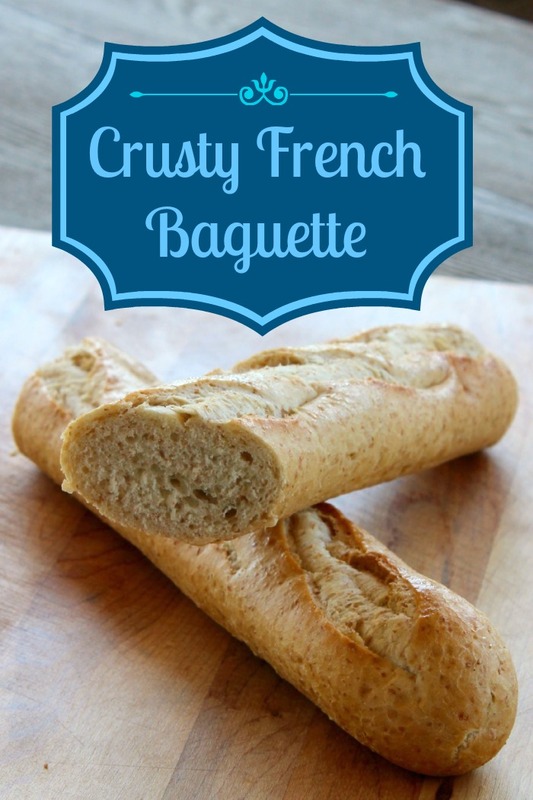 So I researched my cookbooks a few years back to come up with a recipe to make Bill his favorite, the Crusty French Baguette. In my research, I found that that the baguette’s ingredients list is very simple – just 4 ingredients, but that the process is different than a lot of yeast breads. It is definitely not a fast food process but instead a lengthy process, not in labor but in total time with longer rising times than most yeast breads and the need for a starter mix. I did find “faster” recipes but because of the certain steps left out they do not have the authentic flavor that only the longer process can impart to the dough. I have well meaning people question things like the ingredients; why only 4 ingredients or isn’t there supposed to be sugar to promote the yeast growth? The ingredients are simple – water, yeast, flour, salt. And the omission of sugar is not a mistake. The small amount of yeast and the extra-long rise causes the growing yeast to release organic acids and alcohol which will give your baguettes their outstanding flavor. The process is as important to the baguette as the ingredients so don’t skip steps. Making a baguette is part science and part art. I use a stand mixer with a dough hook to make bread. 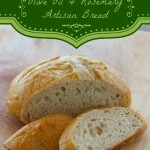 It is so much easier than hand kneading and works really well producing a consistent product time after time. Another piece of equipment that I find invaluable to make artisan bread is a pizza or oven stone. It gives an evenly distributed subtle heat to the bottom of the bread and assures even cooking. I also use parchment paper and a cast iron skillet in the process. Making the Baguette Starter – what makes the baguette special! We are going to start the day before we plan to bake with the creation of a “starter” much like the process for sourdough bread. The ingredients for the starter are going to be very simple – 1/2 cup of room temperature water, 1/16tsp. of active dry yeast, 1 cup of all purpose flour. In a medium sized bowl, add the yeast to the water and gently stir to dissolve the yeast. Add the flour and mix gently to make a soft dough. Cover with plastic wrap and set aside for at least 14 hours (overnight works well) at room temperature. The starter should increase in size and become very bubbly. Be sure to take the time and steps necessary and you will have a baguette worthy of a picnic on the Seine. Combine the active dry yeast with the warm water in the stand mixer bowl. Stir gently to dissolve the yeast. Add the starter, flour, and salt to yeast/water mixture and turn on mixer to speed 1. Mix until the dough comes together in a cohesive unit (it still may be a little rough on the exterior). Turn the mixer speed up to 2 and let the mixer knead the dough for 5 minutes. Grease the inside of a medium sized bowl. Place the dough in it and cover the bowl letting the dough rise for 1 hour in a warm place free of drafts. Gently deflate the dough and turn it over: cover again and let it rise for another 2 hours. Turn out the dough on a lightly greased surface and divide it into 3 equal pieces. Shape each piece into a slightly flat oval which you then individually wrap in greased plastic wrap. Let them rest for 15-20 minutes. Take one piece of dough and fold it in half lengthwise and seal the dough edges with the heel of your hand. Flatten it again, and fold and seal again. Place the dough seam-side down, and gently roll the dough into a 14-16″ log. Place the dough seam-side down on a parchment-lined sheet pan. Repeat the procedure with the other two pieces of dough. Cover them with lightly greased plastic wrap, and let the loaves rise about 1 1/2 hours. They will become very puffy. About 20 minutes before they are done rising, preheat the oven to 450 degrees with the pizza stone on the middle rack and the cast iron skillet on the bottom rack. Take a sharp knife held at about a 45° angle and make three slashes on a diagonal in each baguette. Gently slide the baguettes, with the parchment paper onto the pizza stone. Put 1 cup of ice cubes in the cast iron skillet. This provides the steam to make a crispy crust on the baguettes. Bake the baguettes till they are a deep golden brown, about 25 to 30 minutes. 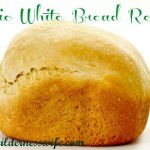 If you enjoy home-baked bread you might like my collection of bread recipes including the KitchenAid Basic White Bread Recipe, my multi-grain Slow Cooker bread recipe (yes, a bread that bakes in your Crockpot), my Olive Oil & Rosemary Bread. 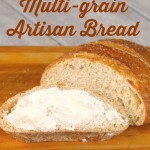 Visit the bread recipe collection by clicking here. This looks perfect. Thanks for posting. Hello from Clever Chicks Blog Hop. I agree with you on the dough hook for making bread. I have found that I need to add more flour when I hand-knead and the bread is definitely heavier.